Most of the time we think of community as the area we live – it might be our rural neighborhood, our town or even our county. 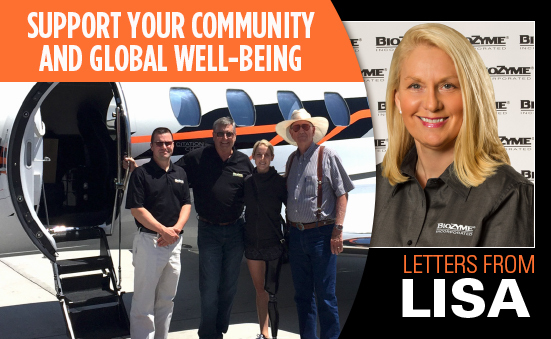 But for one BioZyme® dealer with a passion for the equine business, her “horse” community stretches from New Mexico to North Carolina and from Wyoming to Florida. Kaycee MacGibbon, from Crouse, N.C., comes by her passion rightly; she is the fourth generation born into a rodeo family. She and her family always worked with horses – raising, training, breaking, showing and competing on them. It wasn’t until tragedy struck in 2014, that she started advocating for their health. 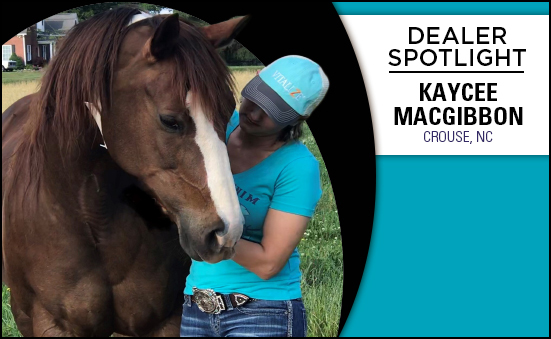 Although MacGibbon experienced immediate results when she put her horses on Vitalize, it was almost a year later before she decided to become a dealer. And now, she shares the Vitalize message of the importance of a “good gut feeling” with her equine community, rodeo friends and family both near and far. “A lot of time when you start new products, the first 60-90 days you are like ‘wow, this is really working,’ then it plateaus, and it quits working. But with Vitalize it did not do that. It improved the animal’s overall health, digestive tract, hoof, hair coat, brain, everything. It continued a year later, which was really impressive to me because I have never seen another product do that. I wanted to become a dealer because I wanted to share this with all my people in the barrel horse industry, rope horse industry, the rodeos, the shows, and everybody to be privy to this information and have this help their horses as much as it has helped mine. And through that I met (ASM) Justin O’Flaherty, and I became a dealer and it has been a huge snowball effect from there,” MacGibbon said. With such a large network of friends and colleagues in her equine community, MacGibbon said it hasn’t been hard to sell the products. And if she gets people interested in the product too far from home, she will point them in the direction of an another ASM like Rowdy Pope who will help them find a dealer in their area. MacGibbon said the split is about even with her approaching people to tell them about the products or people coming to her seeking advice about their horses. But her advice and the outcome are almost always the same – the horses usually have gut health issues, and Vitalize typically makes them feel better. “If the gut’s weakened, the body’s weakened. And 99.99% of the time, it is poor digestibility. Basically, their horse’s digestive tract has shut down, and we get them on the Vitalize. In 10-15 days, I get a text, saying ‘Oh wow! My horse is already looking better. They are happier; they are healthier. Thank you so much.’ I usually say, ‘Don’t thank me. Thank Vitalize,’” she said. And for the skeptics, who are used to a “supplement on every corner,” and not sure they want to try Vitalize, MacGibbon offers some free product because she knows once they try the Vitalize, they will be hooked. She said to this point, she’s never had one person try a “free” sample, who hasn’t returned as a paying customer, making those samples well worth the investment. 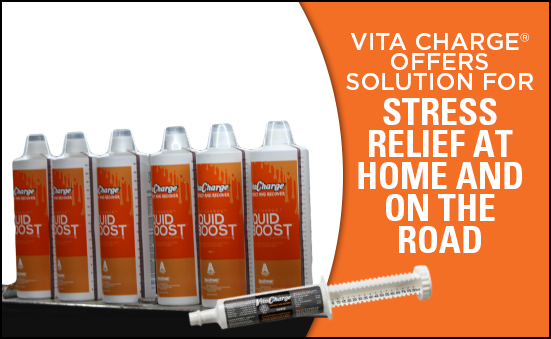 “The product speaks for itself. If they try it, they stay with it,” MacGibbon said. Reaching out to the equine community is what MacGibbon is passionate about. By raising awareness of a sound nutrition program that starts with gut health, she knows she is making a difference for her generation of equine enthusiasts and those generations to come. This quote by Helen Keller epitomizes the spirit of community, especially at this “most wonderful time of the year.” It is often hard to think about those less fortunate in our communities and how we’d like to help them, especially with the agricultural economy in its up and down cycle. We are busy paying our own bills and trying to provide a nice holiday for our families. However, if we come together with our coworkers, friends, a church group, or another organization we can make a difference without breaking the bank. One thing that BioZyme® did during November is gather food for community food banks. 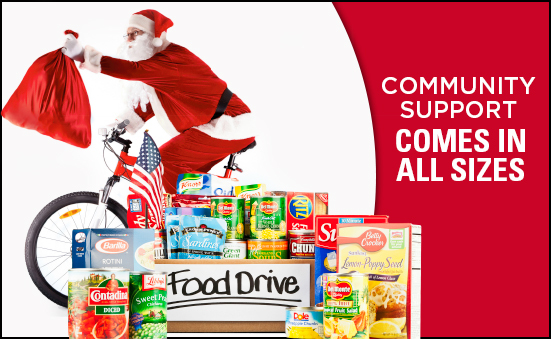 That’s right; employees across many locations including St. Joseph, Mo., Haskell, Texas, and Area Sales Managers and other remote workers gathered nonperishable food items for local food banks. Between the St. Joseph and the off-site workers, employees had the potential to donate to 30 banks in 16 different states from Pennsylvania to Texas to Montana to Missouri. One employee visited a local grocery store where she purchased two cases of canned vegetables, four cans of chicken, a large tub of peanut butter (think non-perishable protein), a box of crackers, a jar of meaty spaghetti sauce and a box of pasta for less than $25. If each person gives similarly, that can feed several people for several meals. And in that employee’s mind, that is two trips through a fast-food drive through for her family or roughly four “foo-foo” coffees for when she gets to the big city – not a major sacrifice for others that are truly in need. Perhaps your town has a local soup kitchen. Those places are always looking for volunteers to make and serve a meal. Would it really hurt business to shut down to a skeleton crew for a few hours one day to go and serve the community? Perhaps leave a few employees at the store to serve your customers but take the rest to the local soup kitchen or homeless shelter to help prepare and/or serve a meal. The gratitude levels do vary, but your personal satisfaction in knowing you made a difference will soar. 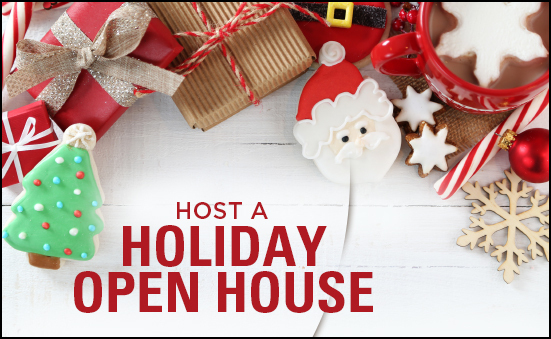 Several organizations typically have an opportunity to “adopt a family” by providing gifts and holiday meals for families that might not otherwise have a nice holiday. Adopting a family as a company might seem daunting or not in the budget, but if your company and its employees work together to adopt a family it can be a little easier on everyone’s checkbooks and make a lasting impact on a family. I remember when I worked at another company, we adopted a family with four or five kids one year, and they all needed winter coats and wanted bicycles. Well, we worked with the local Wal-Mart and K-Marts in town to get bikes at reduced rates when we told them what we were doing. Several of my male co-workers who didn’t really want to “shop” all pitched in a set amount – probably around $20 – and we made sure that family had bikes and warm coats. I signed up to help with the delivery that year. And even though we contacted the mom to see if she wanted to have the bikes be from “Santa” she refused. She wanted her kids to know that kind people gifted her kids those bikes. I’ve never seen 7 and 8-year-olds cry tears of joy for coats and bikes, and it was truly one of the best Christmases I’ve ever experienced. Giving back. It is more fun to do as a group and the impact is often greater. It doesn’t have to put a big hit on one person or company’s checkbook if we all work together to make a few sacrifices to give to those less fortunate. And together, we can do so much more. 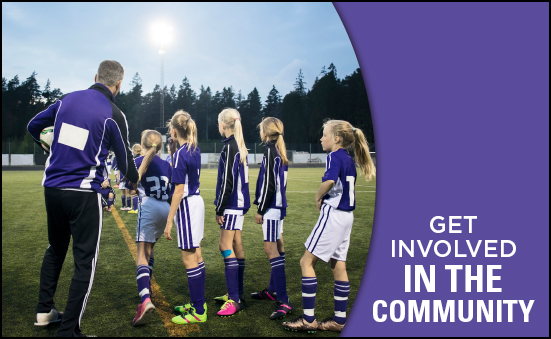 Taking an active role in your community is important for a number of reasons. Here are 5 ways we encourage you to get involved in your community, year-round; not just during the holidays. You might just meet some new customers while you’re at it. Community Boards. Most communities have a plethora of boards that are always looking for people to serve on them. These can include school boards, hospital boards, extension boards, 4-H boards, FFA alumni boards, cattlemen’s boards and the list goes on and on. Remember, pick organizations that you are truly passionate about helping, and don’t spread yourself too thin. A volunteer that has too many irons in the fire is often not as helpful as one would like. If you have never used the hospital and you are a normally healthy person who doesn’t think you’ll ever be in the hospital, perhaps that board isn’t for you. However, if you are a cow-calf producer, trying to educate consumers on the benefits of eating healthy, lean red meat, then perhaps a role on the county cattlemen’s board would be ideal. Volunteer. Volunteering shows that you are willing to give your time – one of your most valuable assets. You might volunteer with the local ag groups like 4-H and FFA to help them with educating youth or running a judging contest or clinic. Or you might volunteer to coach youth wrestling, teach Sunday night youth group or help with a cause like Big Brothers/Big Sisters. Whatever you volunteer for, make sure it is something you are passionate about doing and have time to make a priority. No one appreciates a volunteer that is always “too busy” to meet their commitments. Build partnerships. If you are getting involved with your community, building partnerships would seem logical. Perhaps you are building a partnership with a local feedlot to run a mineral trial. Or maybe you find a way to build a partnership with a local high school ag class. The opportunity for agricultural businesses to partner, share promotions and advertising budgets and even costs for producer meetings are endless. Offer internships. Young labor is typically inexpensive and hardy. Are you looking for someone to help in the store after school and on weekends? What about one of these young “techno-kids” that could help you with your social media presence. Young people are always looking for “real-world” experiences, and often are willing to work for little money or the experience they can list on their resumes. Host & participate in events. As livestock nutrition suppliers, it would make sense that you would host and participate in events, like judging clinics, livestock shows, barrel racings and ropings. However, you chose to participate in these events, be sure to get your company name exposed as much as possible so others in the area know who the title sponsor is. Getting involved in the community – it’s probably something you do anyway. Take the time to make a difference in someone’s life and the future of your community. You might just meet a new customer along the way. Lately, I have been reading about the nine dimensions of a healthy community as developed by the Blandin Foundation. Interestingly, what I have discovered is that many of these are the same dimensions of a healthy business. One of those is a focus on “environmental stewardship.” In my opinion, environmental stewardship equates to an ethic that embodies responsible planning, management and the use/sharing of resources to ensure global (defined however you desire) well-being. Stewardship begins with ensuring individual well-being, transitions into a focus on team effectiveness, and ultimately leads to a need for global stewardship. At an individual level, stewardship focuses on promoting well-being for each person. A simple but impactful example of an act of stewardship occurred when a group of college classmates developed a social initiative to make their campus a happier place. They dispatched club members to go open doors for students as they entered major buildings around campus. After piloting this initiative at various locations, they discovered that their dedicated focus on individuals had a profound effect. Within a few days they could already notice that people on campus were happier than before. Preparing for the prolonged vitality of an organization begins with a focus on individuals, but leaders should continue their stewardship approach by acting at the team level. Leaders are stewards at the team level whenever they work to ensure individuals within the organization interact well with each other. Once individual and team well-being has been addressed, our focus as a business leader needs to switch to the well-being of the global “community” that we are a part of on a daily basis. Investing in the people and causes that are important to build/support that community should be important to every business. At BioZyme® , two of our causes very close to our hearts include youth involved with livestock and veterans. At first glance one would say those two groups of people have little in common, but that is not true. Most of the veterans are young and some were involved with livestock when they were younger. The young soldiers (veterans) chose to defend and protect the rights and freedoms that we enjoy in this amazing country. Our youth in livestock are the most comforting future leaders of this great country. Both are groups with harmonious tasks and roles. Sharing our resources with these two groups is an important blessing we cherish at BioZyme. During the holiday season, more than at any other time, our hearts go out to others. I encourage you to give now, but to also give what you can regularly to the things that make a difference to your “community” and its global well-being. You may be surprised at the benefits you reap!